^ Djimon Hounsou pronunciation. Forvo.com. 14 December 2009 [24 November 2012]. ^ See co-star's pronunciation at approximately 7:32 and 7:47. Never Back Down - Interviews.... YouTube. 20 September 2010 [24 November 2012]. ^ See the interviewer and DiCaprio's pronunciations at approximately 3:57 and 4:04. Blood Diamond Leonardo DiCaprio interview. YouTube. 29 September 2006 [24 November 2012]. 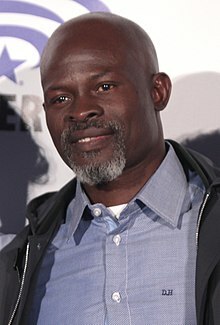 ^ Djimon Hounsou: Biography. TV Guide. [22 November 2012].